Each year on the 4th of July, we find time to reflect upon that crescendo moment in history when hard-fought freedom was bestowed upon our nation. Since setting us on that initial revolutionary course in 1776, the Founding Fathers’ vision of inalienable rights and independence has been passed down through generations, manifesting itself continuously in the American mind and spirit. But less often emphasized is the Founding Fathers’ strong entrepreneurship and business acumen, which set a precedent of innovation and self-reliance in their respective communities and is an equal contributor to that go-getter, rough-and-tumble American mindset. George Washington, one of the greatest and yet least acknowledged entrepreneurs of our nation’s history, transformed his small Virginia farm of Mount Vernon into a prosperous industrial village. Washington’s fishing business processed 1.5 million fish per year across 13 American colonies, while his gristmill and distillery are architectural wonders that anticipated modern factories. Thomas Jefferson, at the ripe age of 81, nearly single-handedly founded the University of Virginia and served as its first president. Alexander Hamilton established the Bank of New York, which regularly made 30- to 90-day loans to local entrepreneurs. Benjamin Franklin, a prodigious inventor, revolutionized the world of print media and also created the lightning rod, which would later allow for electricity to take hold and spur the industrial revolution. Not only did these men set the stage for life, liberty, and the pursuit of happiness—they paved the way for entrepreneurs and what we now call “start-up” businesses. This spirit of innovation obviously still remains very much alive in our nation today. In 2012, the percentage of adults involved in startups hit an all-time high of 13 percent. As business leaders, there is still a lot to learn from the legacy of these great men. And I believe that there are several common threads—risk-taking, innovation, and a fully realized mission and vision—that lay behind successful businesses, no matter the century. Due to associated taxes and its depletion of Mount Vernon’s soil, George Washington abandoned the most common cash crop of his native Virginia, tobacco, in favor of a less familiar, but higher-yield, crop: wheat. “Real entrepreneurs risk what they know for what they might learn,” says Forbes’ Jim Blasingame. Launching Celerity in 2002, during a time of great economic uncertainty, was a calculated but risky move for our founder and CEO Michael Berkman. In the tech world, the dot-com bubble had just burst and the markets were shell-shocked. IT staffing had become highly commoditized and the trend towards more strategic consulting and project-based services rose. Established competitors were facing difficult decisions on how to adjust their businesses. As a startup, Berkman realized he could be opportunistic and custom-build the services the market was looking to buy. In less than ten years, Berkman now runs a $100 million company uniquely positioned between the large consulting firms and pure IT staffing firms. As further evidence of Berkman’s strong entrepreneurial ideals, he earned a finalist spot on Ernst & Young’s 2012 “Entrepreneur of the Year” List. Risk-taking in business and professional leaps of faith (when well-calculated) can change the course of a career, a company…even a nation. So, as we say here at Celerity…what’s holding you back? Just like taking risks, it takes steadfast courage to tackle complex problems with new strategies and techniques. The Celerity core value of creative courage has become the hallmark of our business—as it was for the Founding Fathers. All of Benjamin Franklin’s inventions—bifocals, the Franklin Stove, and the lightning rod, to name a few—were models of practicality and the result of improving upon other people’s problems in creative ways. And don’t worry if your creativity results in a product or service that wasn’t what you planned. Nothing ever is. How do you think we got microwave ovens, post-it notes, and saccharin? Yep. All “accidental” innovation hard at work. It can be a ghastly task to decide upon and articulate what it really is you’re trying to do—and then stick to it. According to historian Joseph Ellis, the now-revered Declaration of Independence (a.k.a., the “mission and vision” of America) was, at the time, regarded as a “minor administrative chore,” one taken on by Jefferson only after Benjamin Franklin and John Adams spurned the opportunity. But before you can truly carve a uniquely successful path for your organization, you have to be able to answer the questions, “What is our mission? Why does our business exist?” in ten words or less. We created a common purpose, vision and message that were believable, aspirational, and authentic. And then we put that message into action. Do your employees believe and live out your mission and vision? 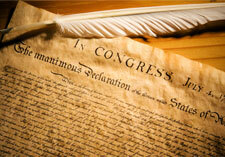 How you are applying the Founding Fathers' core values to grow your business?